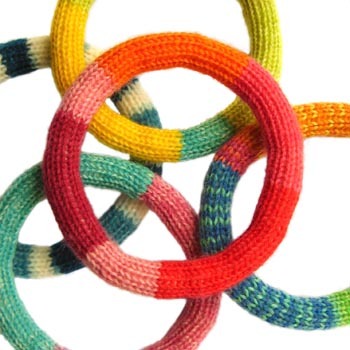 The seamless bangle is made from a tube knitted on four needles. To hide the join we will be doing some fiddly seaming using Kitchener stitch. 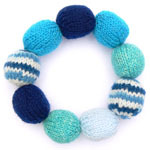 These bracelets look good in sock wools with varying colours. Step 1: Cast on 9 stitches and join into the round. Step 2: Knit 2cm straight. Step 3: Looking at the knitted fabric of the tube you will see that each row is made of a series of loops, each with a right-leg and a left-leg. Insert a stitch keeper under the right-leg of 5 loops in a row about 1 cm from the cast-on edge. Turn the tube over and insert the second stitch keeper into the next 4 loops in the same row. Step 4: Unpick the cast-on edge and unravel the knitting back to the picked-up stitches. Step 5: Return to the working end of the tube and knit until it measures 22 cm stopping every couple of centimetres to poke a little toy stuffing into the tube. Leave a long tail of yarn for sewing up. Step 6: Rearrange the stitches so that the first 5 are on a stitch keeper and the remainder are on a single needle. Transfer 4 stitches from the cast-on end of the tube onto a needle. You should now have two knitting needles in use with 4 stitches on each. We are now going to use Kitchener stitch to graft the ends of the tube together. Thread the loose end of yarn onto a tapestry needle and hold the two knitting needles together so that the tail of yarn is at the top right. Insert the tapestry needle p-wise into the first stitch on the front needle then k-wise into the first stitch on the back needle. The next four steps form the Kitchener stitch. Repeat until all stitches have been grafted together (you will need to stop half way through to transfer the remainder of the stitches from the stitch keepers onto the knitting needles). k-wise into the first stitch on the front needle. p-wise into next stitch on front needle. Leave this stitch on the needle. There should now be only a small hole left. Make sure the seam of the bracelet is fully stuffed before sealing this and losing the loose ends of yarn inside the bracelet. 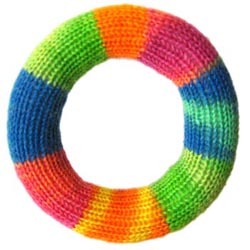 This pattern is for a bangle 9 stitches around but it is easy to adapt to make different size bracelets. Cast on more stitches for a chunky bracelet (although more than about 20 stitches around and they can become a bit unwieldy). Adjust the length of the tube to make child size bracelets or roomier bangles for larger wrists. 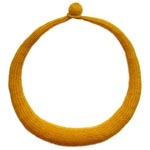 The bangle in the photo is 18 stitches around and 23cm long.